Here you can enter the location/URL of the Repository you want to embed into the directory Path. Path can be entered as a relative path within the active source tree, but can also be an absolute path (pointing to the active source tree). The folder should be empty or non existent. If you don't want to integrate the HEAD of the Repository, you can enter a different Branch. By pressing OK, the entered Repository is cloned and integrated into the current source tree. Initialize the submodules and/or update the registered submodules, i.e. 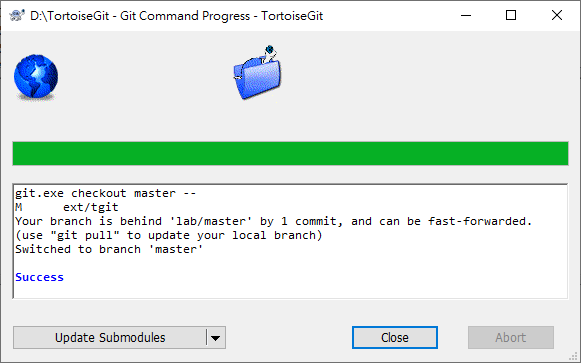 clone missing submodules and checkout the commit specified in the index of the containing repository. 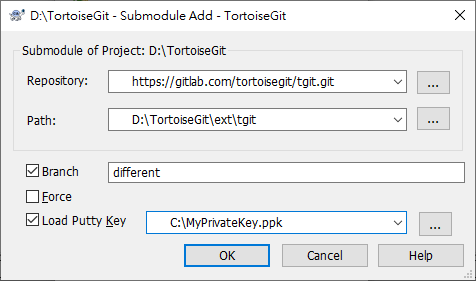 Submodule Sync: Synchronizes submodules' remote URL configuration setting to the value specified in .gitmodules. This is useful when submodule URLs change upstream and you need to update your local repositories accordingly. 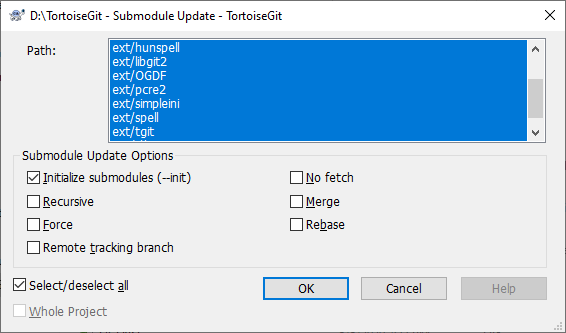 You can find more information at the section called “git-submodule(1)”.